The technology startup xTurion, winner of the Russian Startup Rating 2012, will be releasing its first home security robot before the end of 2014. The device is able to detect movement, smoke, moisture and temperature, and is also equipped with a camera. As the world heads further into the 21st century, the range of safety devices available to guarantee homeowners peace of mind is growing ever wider and offering a bewildering variety of innovative and technological ways of dealing with domestic security. There are currently plenty of solutions on the international market that allow customers to ensure safety with the help of special wireless sensors (motion sensors, smoke detectors, etc.). But these sensors have a number of drawbacks, such as incomplete coverage and lack of video confirmation, while multifunctional sensor devices are fairly expensive and are not mobile. Russian developers have decided to take another approach to solving the problem. 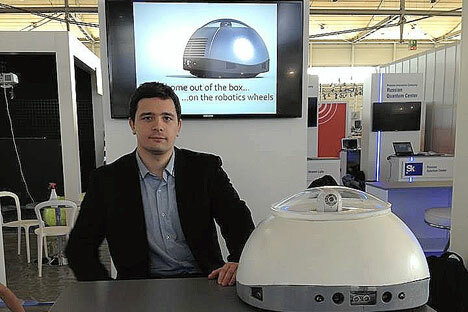 In the middle of March, the Russian company xTurion presented a prototype for a “smart home” security robot at the CeBIT exhibition in Hanover. The company plans to release the first batch of the new product before the end of 2014. So far, the price tag for the robot is around $500-$600. According to developers, xTurion's advantage lies in affordable pricing and multi-functionality. The robot, which is a small unit resembling the popular vacuum cleaner robot, incorporates motion, temperature, moisture, and smoke sensors, as well as a surveillance camera. It even has a sensor that detects leaks. If something happens on the premises patrolled by the robot, the machine sends a signal to the owner. The owner also has the option of viewing what is happening remotely via the robot's camera. The owner can communicate with the robot through Wi-Fi or a GSM-module. Thus, connection with the robot is guaranteed anywhere where there is cellular coverage. The robot adjusts the algorithms of its movements depending on whether or not the owner is at home. The owner can enable a “tracking” mode, and the robot will follow a person around the premises at a fixed distance. The robot also has a night mode, in which the robot stands in place and turns on the light if it detects that somebody is going somewhere. Currently, XTurion, together with Bosch in St. Petersburg, is in the process of developing a device for business purposes. The project has just begun, and the developers are discussing the possible applications of the proposed systems with potential buyers. According to Grigoriev, requests for xTurion products mostly come from abroad; the company is not as popular in Russia yet. Demand for these types of devices has just now started to emerge. Whereas about 20 percent of the U.S. population uses such devices, in Russia the figure is closer to 2-5 percent. For this reason, the U.S. is xTurion's primary market. “We are based in Russia because we were born here and we live here,” says Grigoriev. At the same time, the company already has competition on the U.S. market. The company WowWee, for example, has released a product called Rovio. However, the product is presented as a toy, and the robot can only be controlled through a home network, as opposed to remotely via the internet. The company is also working on a project called Avatar, a robot with full remote control, but it does not have an automatic patrol mode. There are a few other concepts, but they have not moved beyond an initial concept. For this reason xTurion’s creators consider their solution to be the most optimal and competitive. xTurion's plans include aiming for a turnover of $10 million. According to Grigoriev, reaching this number will open up room for discussions about the project’s scalability and profitability. “Of course, we aren't going to stop at this product. In five years there should be fresh developments in the field of robotics, especially since this sphere is actively expanding. There are a lot of ideas that require new developments in technology. But I think innovation will catch up in five years’ time,” he adds. Industry experts have already given the company's innovations high ratings. “xTurion is an excellent product that combines the advantages of the internet, smart homes, and autonomous robots. The team is experienced, and strong partnerships are an indication that the startup has a bright future on the international market,” says Vasil Zakiev, the founder of the hardware technopark Navigator Campus. Investors also see a lot of potential in the project. “The project is very interesting and well researched, the team is professional, and possible shortcomings in business competencies are compensated by the expertise of the staff of [startup accelerator] iDealMachine, who are collaborating with the project,” adds Sergei Vasiliev, managing partner at Starta Capital Investment Company.